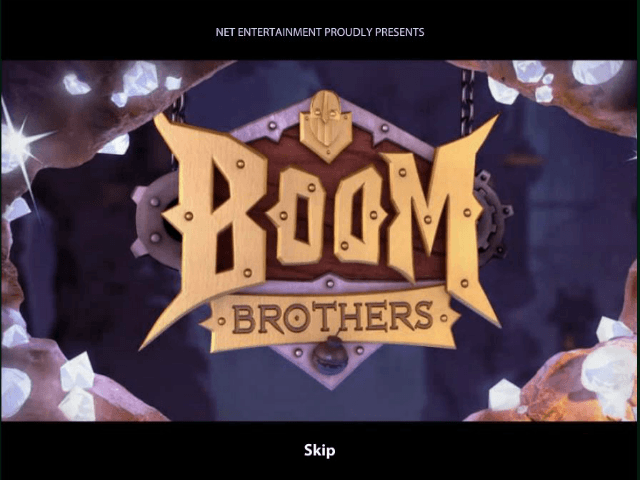 It’s time to bring the boom in NetEnt’s Boom Brothers online slot. This action-packed slot machine is set around a wacky trio of mining dwarfs who like to go around and blow things up. Hence the name, Boom Brothers. It’s an explosive video slot packed with features, and has a high level of detailed animation making it an absolute blast to play. 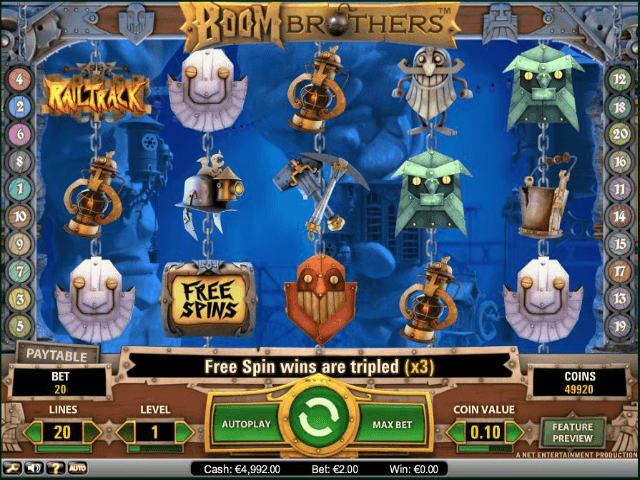 Get the lowdown on this tip-top slot in our Boom Brothers guide! 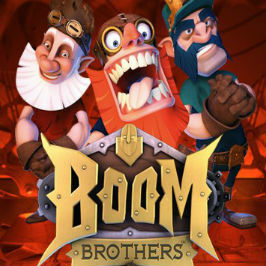 Play Boom Brothers for Real Money! Net Entertainment has delivered some exciting gaming here. This incendiary game is played on five reels and 20 paylines, while the 3D slot has diamonds, rubies, gold and three trigger-happy dwarfs populating the reels. The average return to player is 97% and the total jackpot payout is a handsome 112,500 coins so you can expect lots of booming payouts in the base game. You can spin the reels from 20p all the way up to a maximum bet of £50 per spin. And you’ll blast your way through Wild symbols, Scatters, Free Spins and other bonus features. 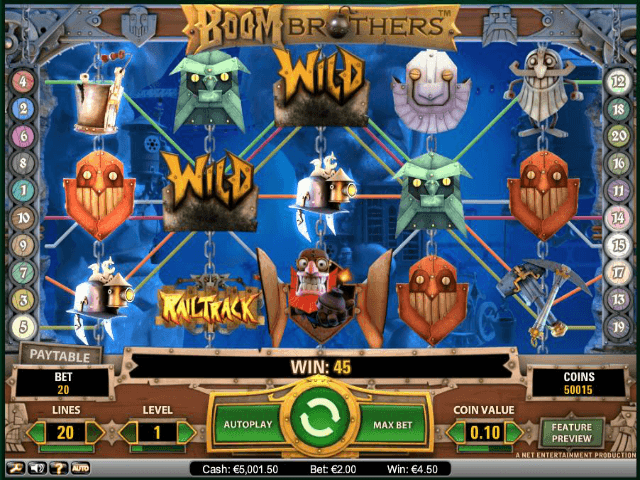 The Boom Brothers slot machine is a wonderfully volatile spinning experience with multiple bonus features to help you win big. The symbols are suspended on chains but work just like standard slot reels. Keep a close eye out for the bomb symbol, this is the Wild symbol and if you land five of these, you’ll trigger a huge 7,500-coin jackpot haul. The mining-theme game features the metallic Boom Brothers as the most lucrative symbols on the reels with the white/silver face being worth a payout of 500 coins for five symbols on a pay line. The red/green faces are worth the other top payouts, as is the full-body Boom Brother symbol. The lower value symbols include a lantern, a pick axe, a bucket and a helmet. The lowest payout on these symbols is 75 for five-of-a-kind on a pay line. Here’s where you can make your bankroll go boom. 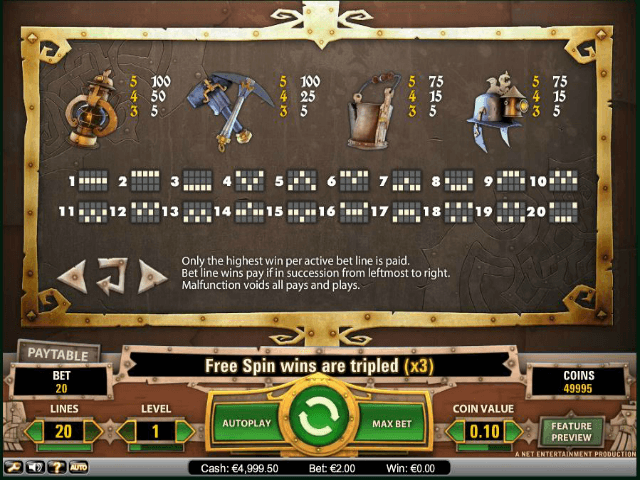 The Free Spins game is activated by landing three of the Free Spins symbols on any of the reels. This will reveal between eight and 50 Free Spins, so it can prove to be a very rewarding feature if you land a high amount (which happens more often than you would expect). You’ll also enjoy a 3x Multiplier for any prizes hit on the Free Spins. You can also re-trigger this feature by landing three or more bonus symbols. The Railtrack bonus feature triggers on three Railtrack symbols on an active payline. Here you’ll enter a mini-game where you’ll help the miniature miners cross the reels in a mining cart by landing pieces of track on reels four and five. The second part of the mini-game sees you click on three carts to reveal a gold bar, ruby or diamond with plenty of prizes to be unearthed. Wait, there’s more. A Second Chance feature gives you a random chance on each spin to boost your chances of slotting those symbols in the right place and creating a winning combination. It all adds up to an explosively good time! Share this Boom Brothers Review today! If you like Boom Brothers, you'll love these slot titles too!